This recipe is from a while ago but I’m sharing it again. Now that I have new updated photos. 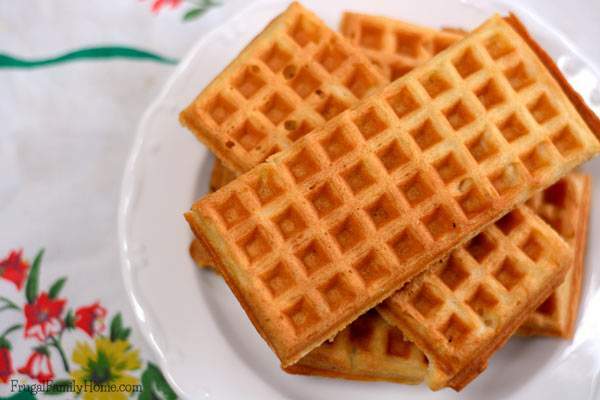 These waffles are so good and freezer friendly too. I hope you and your family enjoy them. For the 4 Weeks to Fill Your Freezer challenge I made waffles. I made a batch of vegan waffles for the freezer. 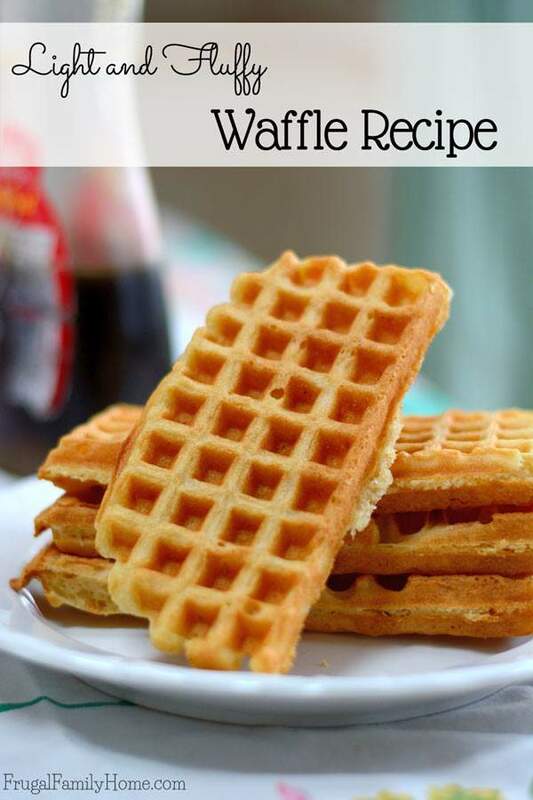 Today I thought I would show the recipe I use to make waffles with eggs. 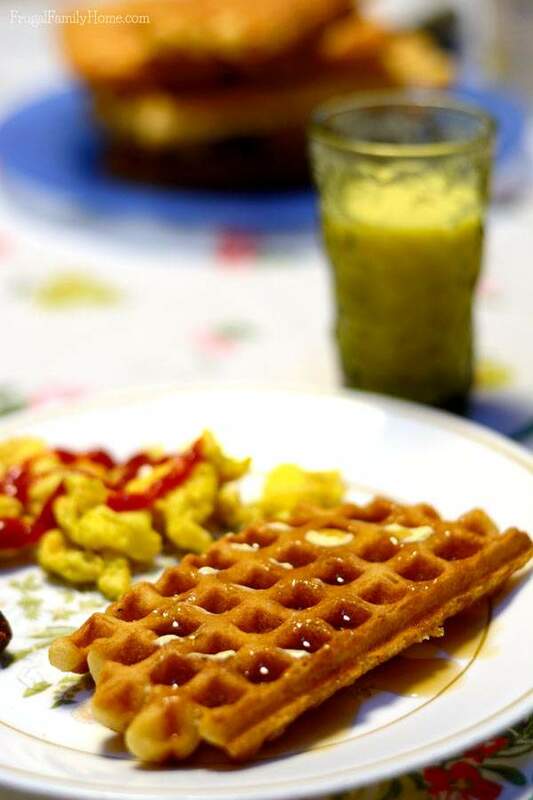 It is a little more involved but the waffles turn out lighter and a little more tender. 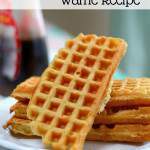 If you have tried to make waffles but they turn out little tough you might give this recipe a try. I use both recipes (regular and vegan) depending on how much time I have to make the waffles. The main difference between the two recipes is the eggs. With this light and fluffy recipe for waffles you’ll need to separate the white of the egg from the yolk. I saw a cool way to do this on Facebook. Check it out here, if you have an empty water bottle and don’t like to touch the eggs at all. I usually just break the shell in half and then separate out the yolk from the white that way. I know you might be thinking this is a way to much work for waffles, but they do turn out so nice, light and fluffy I think they are definitely worth it. When folding in the egg whites be sure to fold them in, instead of whipping them in. You want the egg whites to be mixed in but still provide lightness to the batter. You might also be wondering about the maple flavoring in these waffles. I add both maple and vanilla. 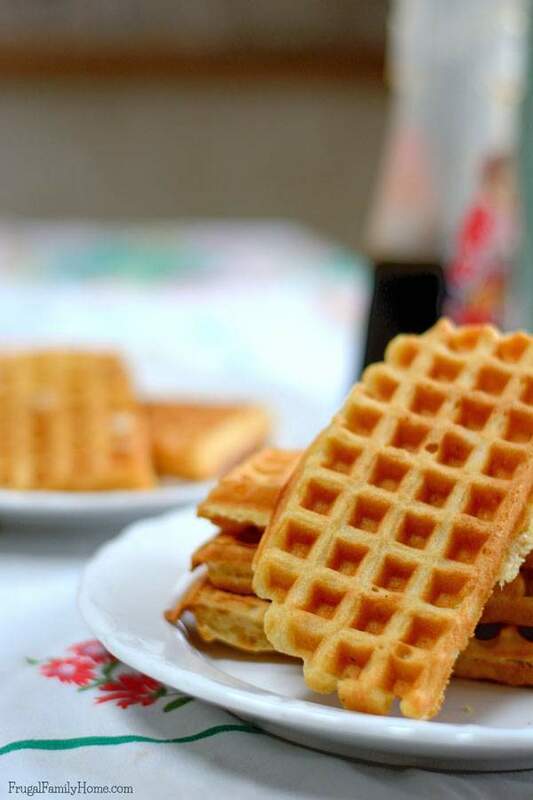 We often will eat the leftover waffles for a snack, and the maple flavor makes them taste really good even without syrup. First, mix all the dry ingredients in a bowl. Put the egg yolks in the dry ingredients. Whip the egg whites until stiff. Then add the wet ingredients to the dry ingredients and mix. Try not to over mix the batter. Once you have your batter and egg whites ready to go pour the batter into the egg whites. Then gently fold them together. At first, you will have lumps of egg white in the batter. After a while of folding your batter will look like this. As you can see most of the egg white is mixed in. 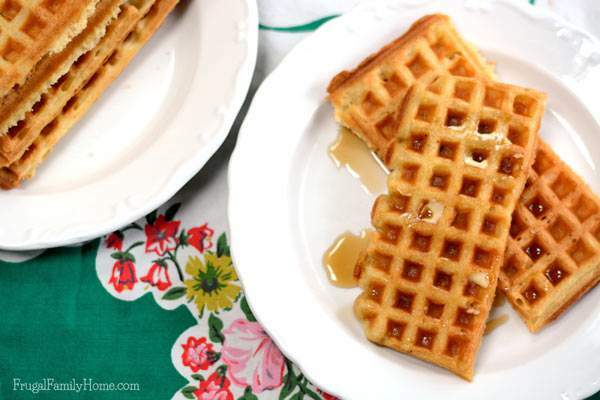 Scoop into a well-oiled waffle iron and bake following your waffle iron’s instructions. I cook mine until the steam stops coming out. Doesn’t this waffle look great? The waffles are so light and fluffy. They are good with berries or pancake syrup on them. Or you might try them with my Easy Blueberry Sauce. These are so much better than the frozen waffles from the store. To freeze these waffles just cool completely and then place them into a freezer bag. Then to prepare just place in toaster or toaster oven and toast. You put maple extract in them so you don’t top them with maple syrup only sugar? Diane, We do put maple syrup on them too. Sometimes the kids will eat the leftovers for snacks without any syrup and they taste so good with the maple extract in them. But they are good plain. Liz, I’m so glad you liked the recipe. Thanks for letting me know.